The festival in its bid to do 'good' is multiplying the ecological damage. "You know rivers are considered very sacred. Rivers are very sacred in our culture… Whenever you consider something sacred you preserve it, you honour it, and you see that you don't pollute it." "We have always used the water of holy rivers like Ganga and Yamuna to purify ourselves, but today we have reached a point where we have to purify this water. So we are waging a war against the pollution in the Yamuna." "There is an ancient saying in India, 'Before you cut a tree, you have to ask permission from the tree.' This is because the tree is a living being." These pearls of wisdom coming from new age guru Sri Sri Ravi Shankar sound like hollow homilies when you see the assault on river Yamuna launched by his organisation Art of Living (AOL) in the past couple of weeks. Throwing all legal, ecological and moral norms to wind - literally - AOL is constructing a make-shift stadium right in active floodplains of the river. The destruction of the river bed is visible to anyone driving through the DND flyway from Delhi to Noida. Illegal massive clearance and construction underway in active floodplain (in red) over some 25ha upstream of DND flyway in NCT of Delhi. AOL is misleading people by publicising that its mega event dubbed World Cultural Festival (to be held from March 11 to 13) is being organised in "open grounds opposite Mayur Vihar Metro Station". 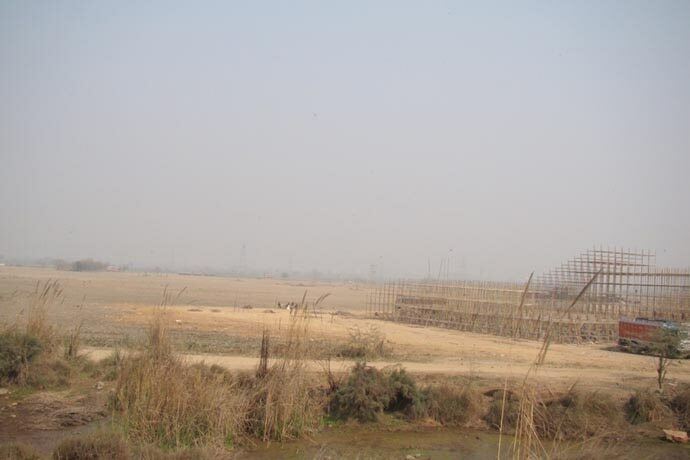 The area opposite Mayur Vihar station has vegetable farms in the Yamuna floodplains and there is no "open ground" there. The event is actually being held in floodplains along the DND as one enters the road from the Ring Road side. 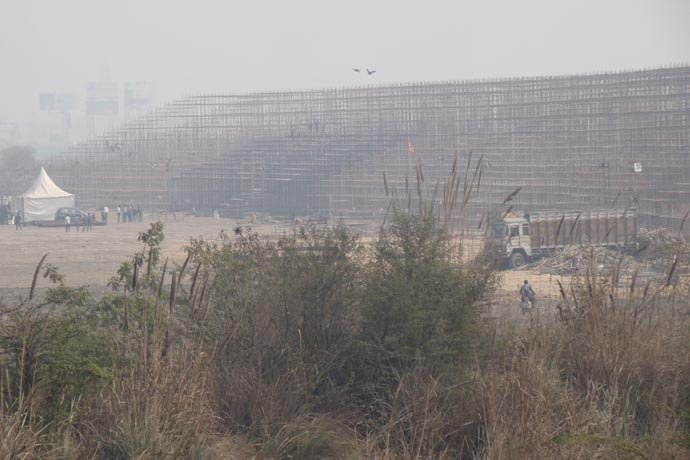 The organisers, however, are describing the venue as "on the banks of Yamuna". The area where the festival will be held, along with approach roads, falls within the region marked as active floodplains of the river, and gets flooded whenever the river gets excess water. Floodplain of a river is a not just an open expanse of land up for grab, as many seem to believe. 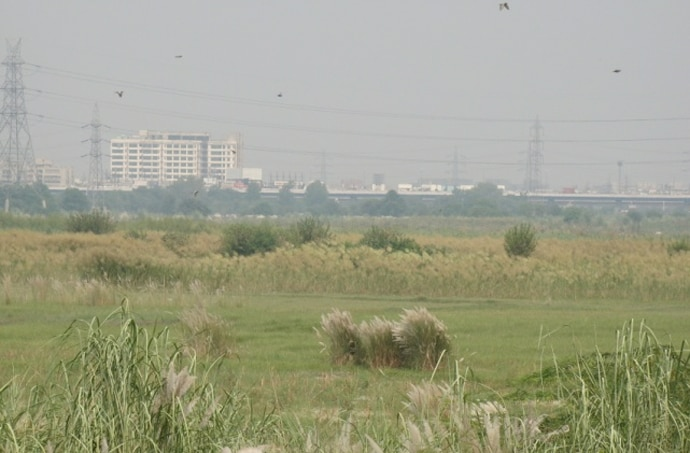 "Floodplains and river beds are an integral part of aquatic system of any river and play a critical role in its ecological flow as well as other functions such as groundwater recharge," according to Manoj Mishra, convener of the Yamuna Jiye Abhiyan, who has been fighting against encroachment of Yamuna floodplains for several years now. 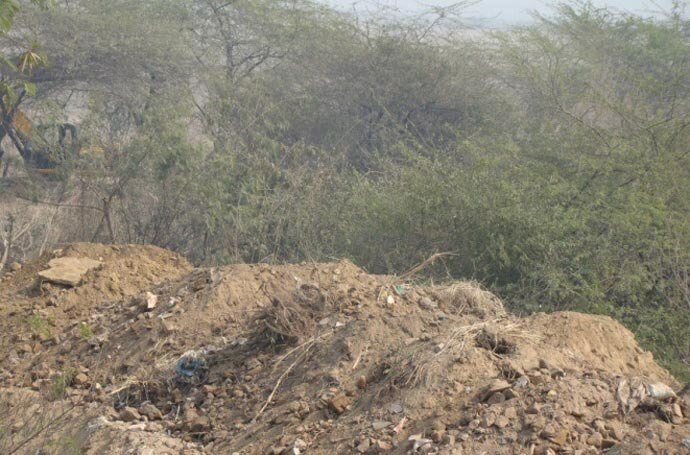 AOL has not only cleared a large area of the floodplain of greenery and levelled it but is also dumping debris elsewhere in the riverbed, thus multiplying ecological damage of the Yamuna. Mishra has taken the matter once again to the National Green Tribunal (NGT), which on February 11 issued notices to all agencies concerned. Mishra's petition claims that construction work is in full swing in an area extending 25 hectares. The construction activity by AOL is a blatant violation of several past orders of NGT specifically prohibiting any kind of temporary and permanent construction in the riverbed and floodplains. "It is an admitted position in law that construction upon floodplain area is prohibited. It not only affects the natural flow of the river but even causes environment problems besides raising risk to human life and property," the Tribunal had observed earlier. Besides being violation of legal and ecological norms, the latest assault on Yamuna goes against what Sri Sri and AOL have been preaching. In 2010, the guru had launched Yamuna clean-up campaign, Meri Dilli Meri Yamuna, at various Yamuna ghats in the city. He had asked volunteers to clean up the river as "millions of rupees have been spent on cleaning the Yamuna but nothing has happened. It's not only the government that can do it. We will have to come together". His organisation also runs an initiative called Jal Jagruti Abhiyan in Maharashtra for revival and de-silting of water bodies. In the state, AOL claims it is working on recharge of underground aquifers - the same hydrological system it is out to destroy in the Yamuna. Is it a case of doublespeak? Journalist, columnist and author based in New Delhi.